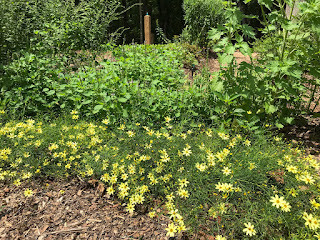 M R Gardens doesn’t usually promote boxed gardens (because it’s easiest and less expensive to build rich beneficial microbe populations innative soil) but it was needed in this location due to a slope. 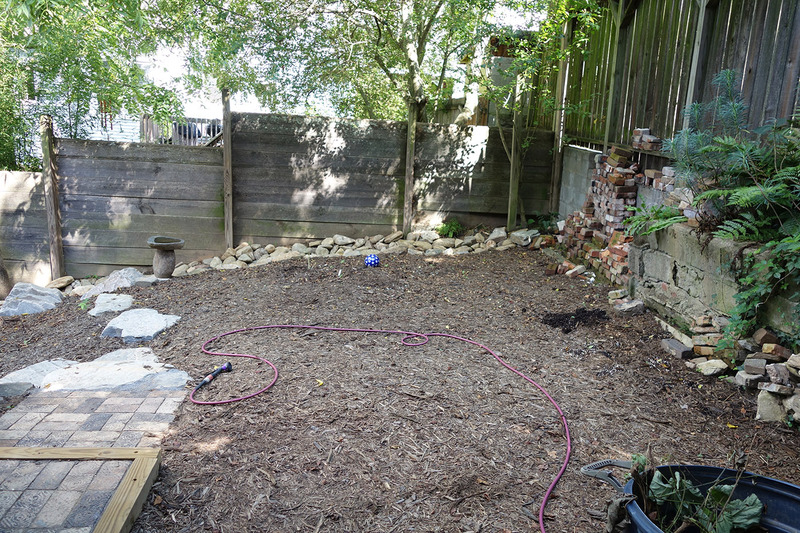 Flint dove into the project! 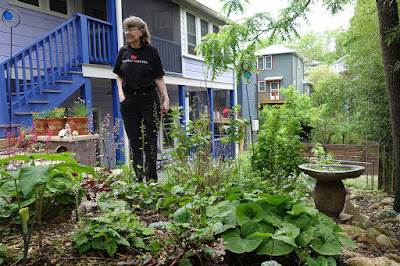 Lin reminds me repeatedly how thrilled she is with a yard full of colors. 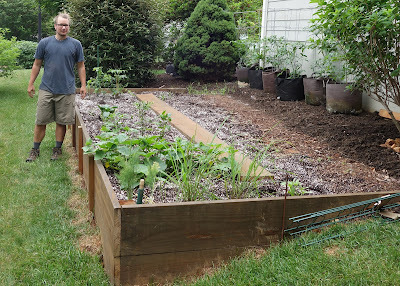 Meanwhile, gardening has helped Tim, who has also participated in M R Gardens’ on-site Grow program, settle into the city, to which they moved last year. 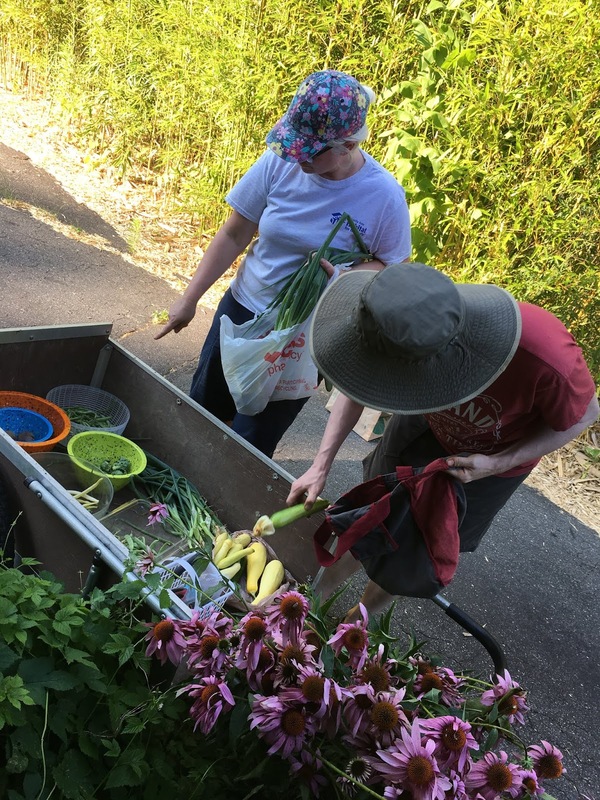 “I very much appreciate all the ways you have contributed to my life here in Asheville,” he said. 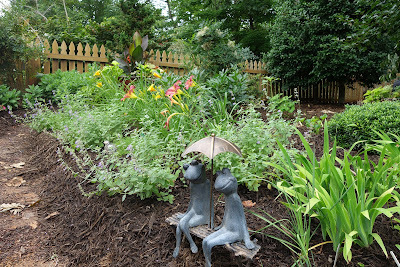 For more information about this design, see this newsletter. 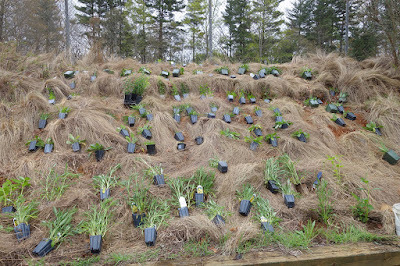 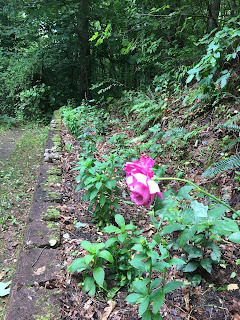 Evelyn’s landscape installation in the Enka-Candler area is in its early stages, but we took the first steps in April by planting Great Blue Lobelia, White Turtlehead, Wild Geranium and Dwarf Fothergilla. 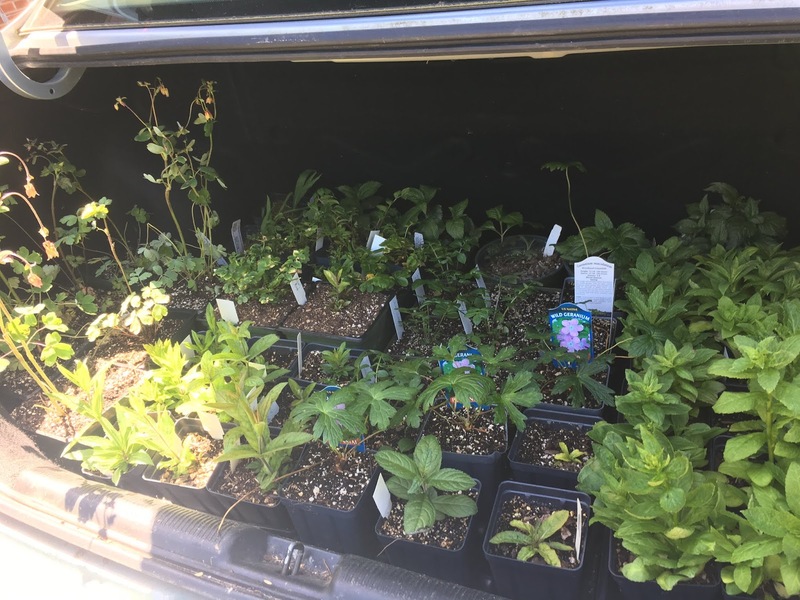 The 13-year-old Honda Civic can really pack in the plants! The backseat of the delivery car. 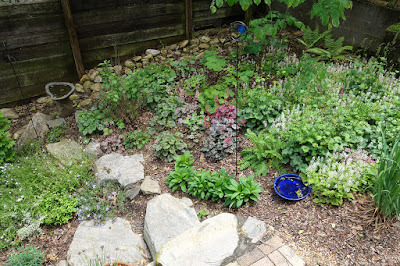 Blue Lobelia and White Turtlehead next to an existing Rose. 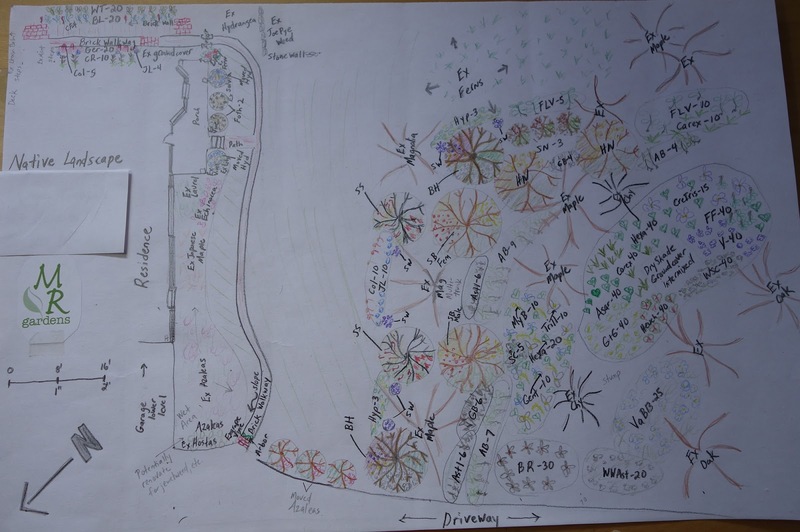 Here’s the full landscape design, which we’ll install in stages year by year. Since Evelyn has researched invasive species as part of your graduate work, as well as worked on projects in the national forests in the past, she has a great understanding of how plants grow naturally, and now we're weaving that knowledge into landscaping. 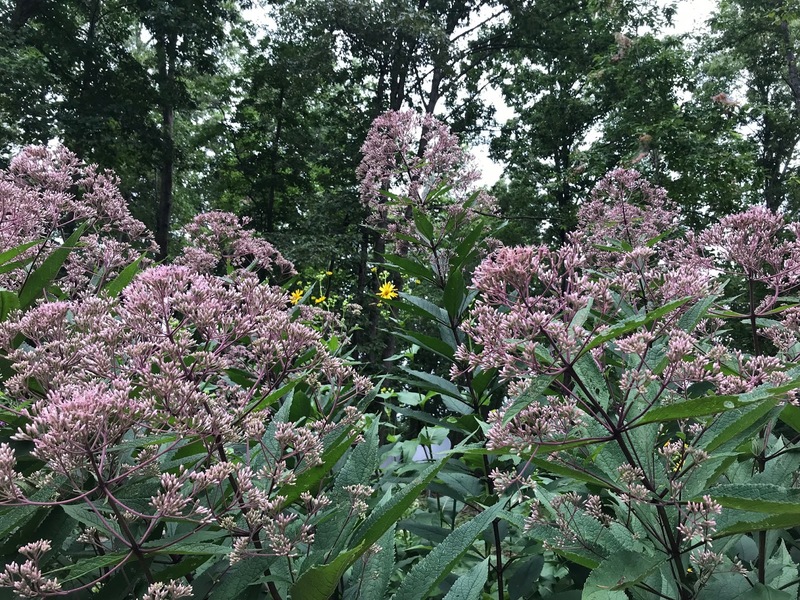 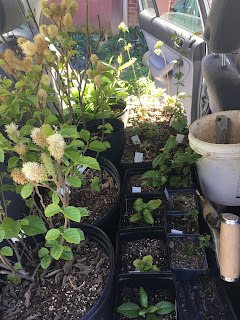 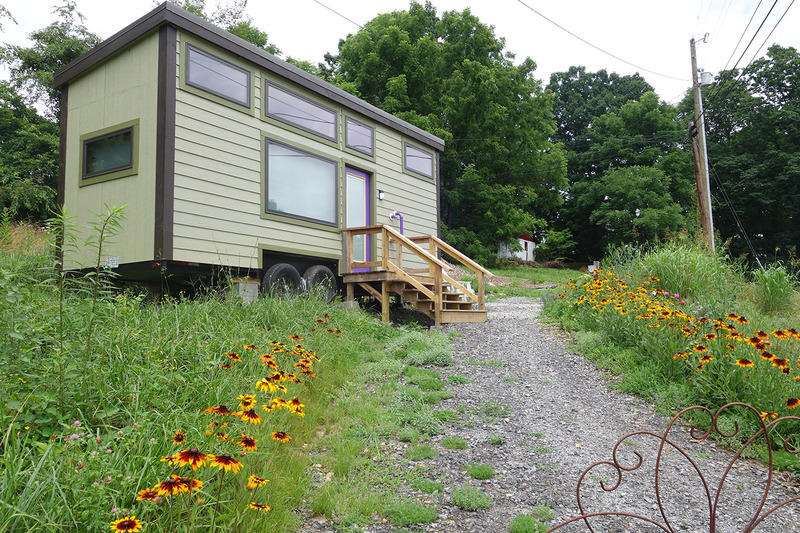 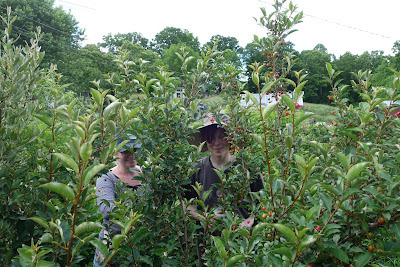 This spring, we also took Doug's landscape in the Reynolds community to the next stage (read about it here) by planting Serviceberry and low growing native perennials in a mulched area we had prepped the previous fall. 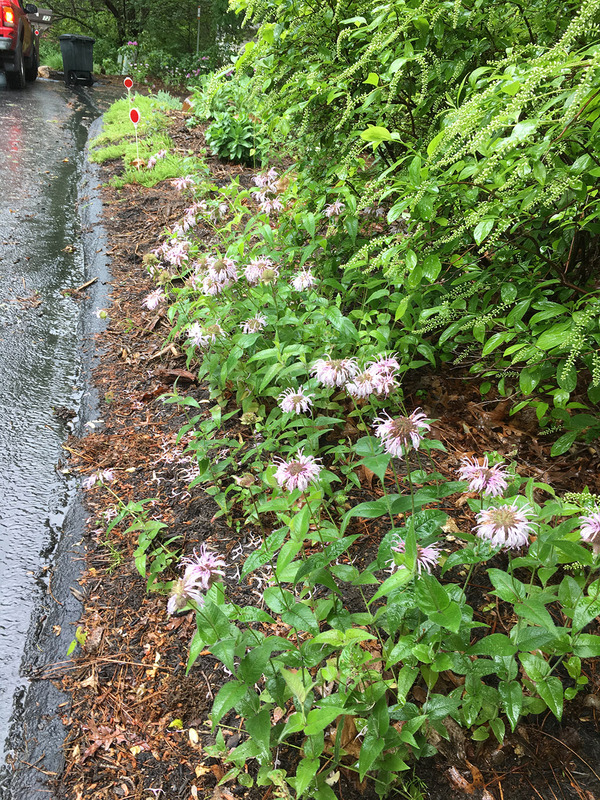 In the meantime, almost all the Bradbury’s Monarda we planted last spring have returned! 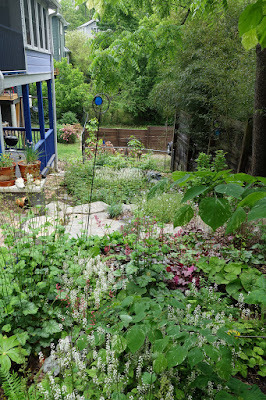 (That’s not always a given with first-year herbaceous perennials). 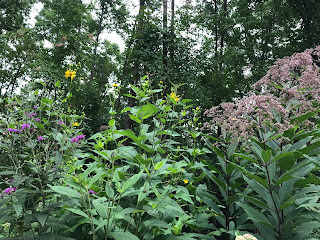 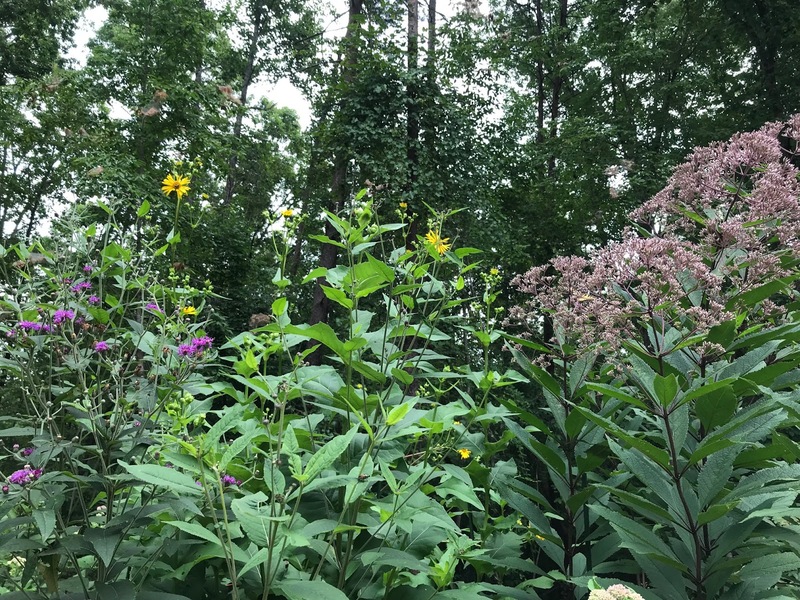 In part because of his involvement with the Audubon Society, Doug has been inspired by his love of birds to create a natives landscape, and had a list of the plants he wanted to incorporate in his landscape before even contacting me last year. 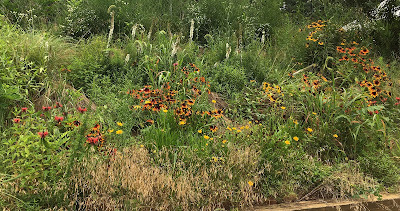 He continues to have great ideas, drawn to up-in-coming landscaping philosophies like Claudia West and Thomas Rainer's ecological planting, which I too have been keeping an eye on. We'll continue to tweak his design as we learn more. 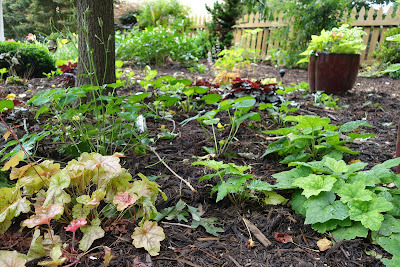 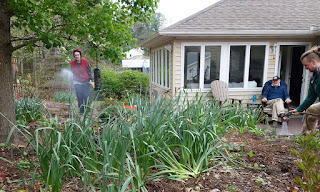 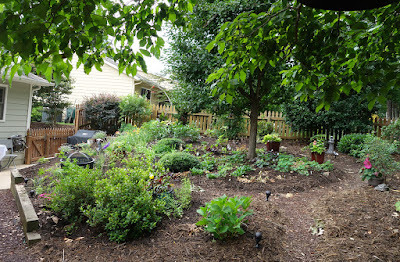 Susan, M R Gardens’ veteran client, keeps adding and learning and gaining from her garden. 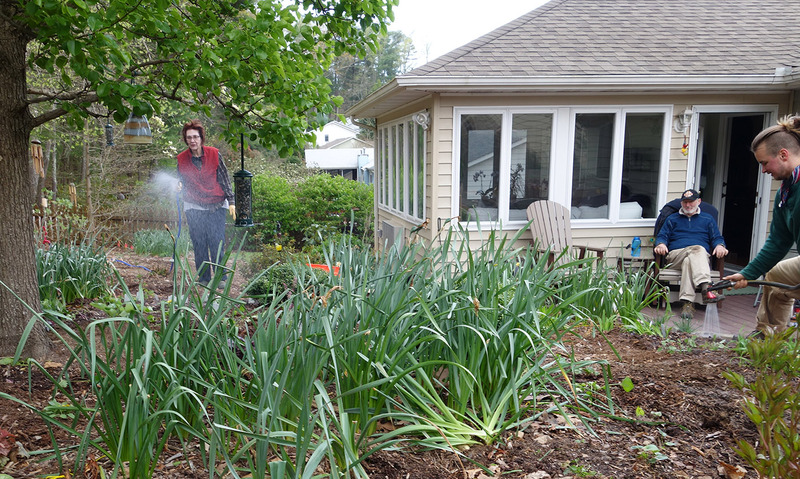 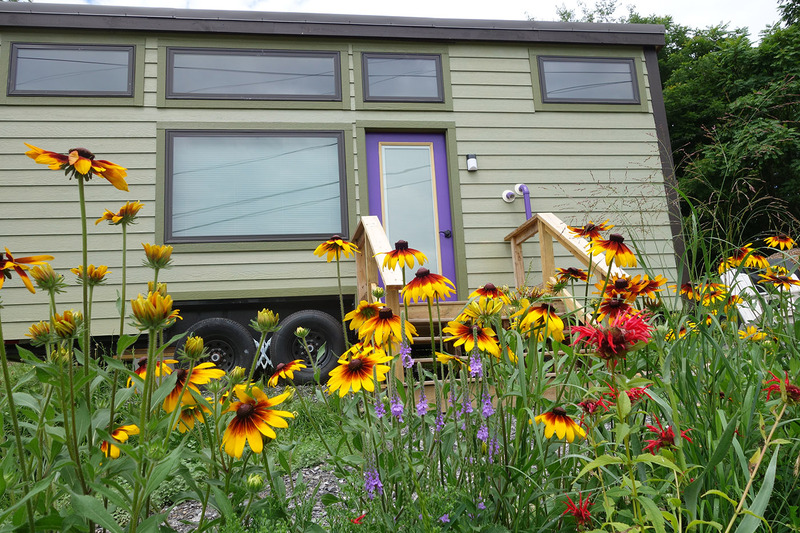 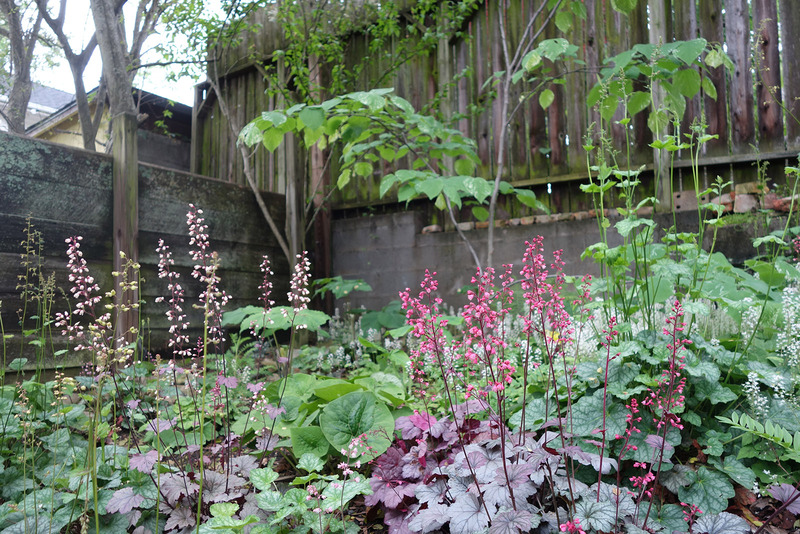 “I can’t tell you how much joy this garden gives me,” Susan said. “It just fills my heart,” especially as she’s walking around it in the mornings while the birds and other wildlife chirp and buzz. 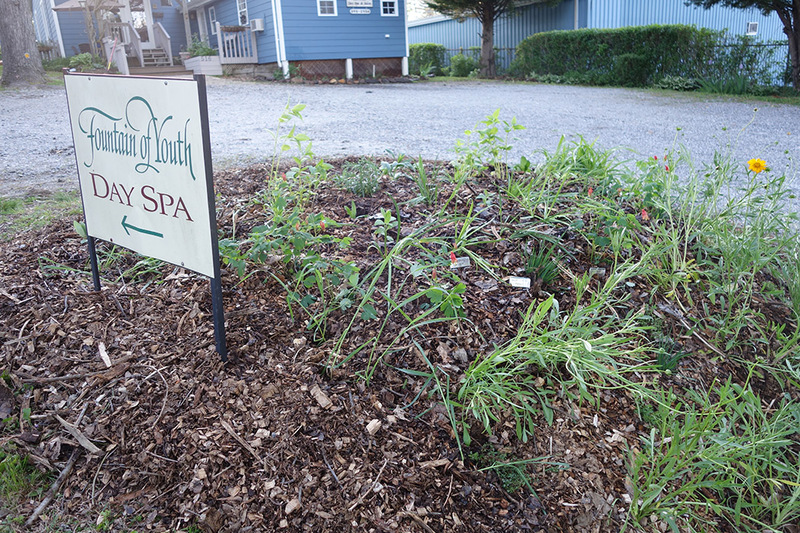 We took on quite a few “firsts” this year, including revamping the landscape of a spa in Hendersonville. 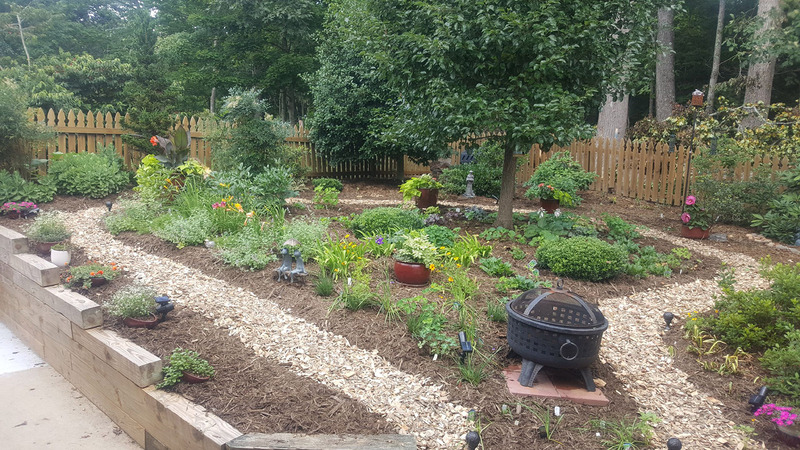 Typically our garden clients are involved with the project every step of the way, but extensive participation is nearly impossible for a business owner whose every moment is precious. 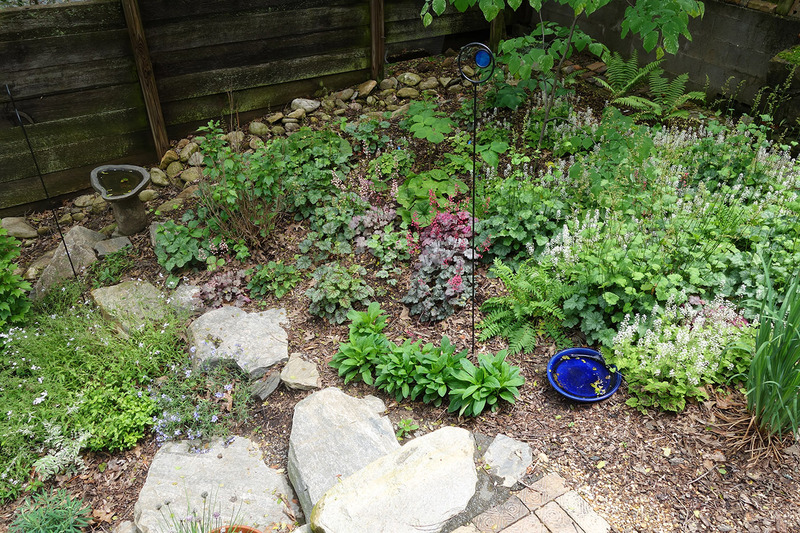 Given that a spa fits so well with M R Gardens’ aim of healing through plants, we went ahead and took on this project even though the owner could only be minimally involved. In the midst of the project, we realized that an integral part of any native, medicinal and edible landscape is the owner. 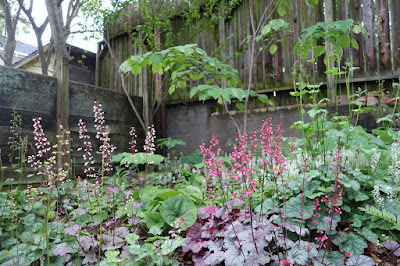 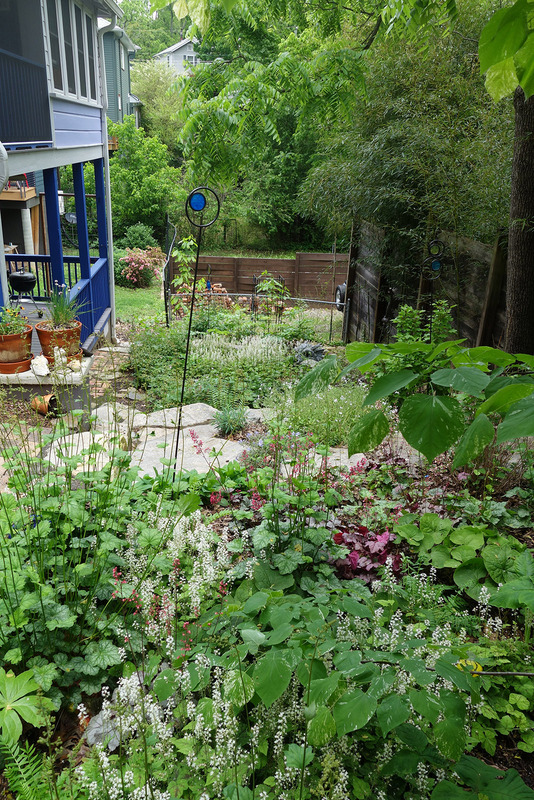 The garden is not just for aesthetics, but for so many other values that the owner gains from. 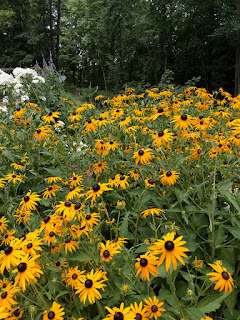 So to take the owner out of the equation is like taking out the heart of a being. 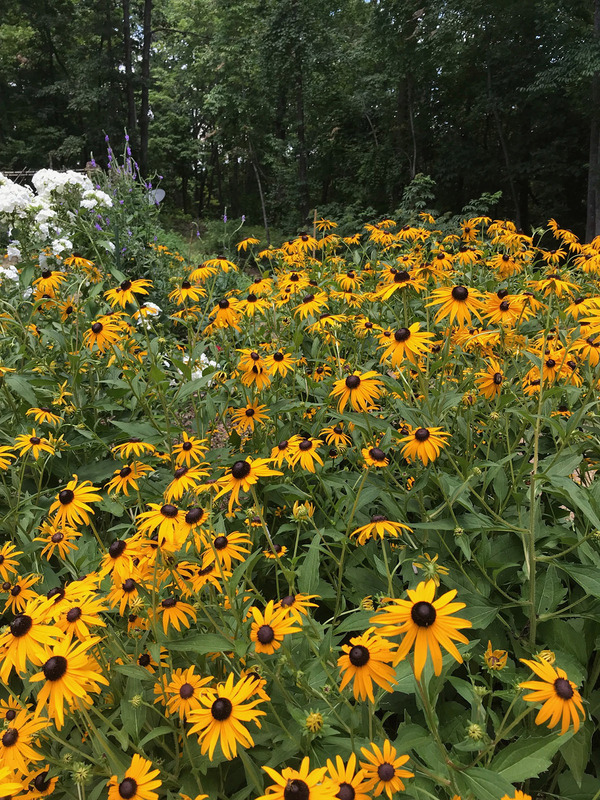 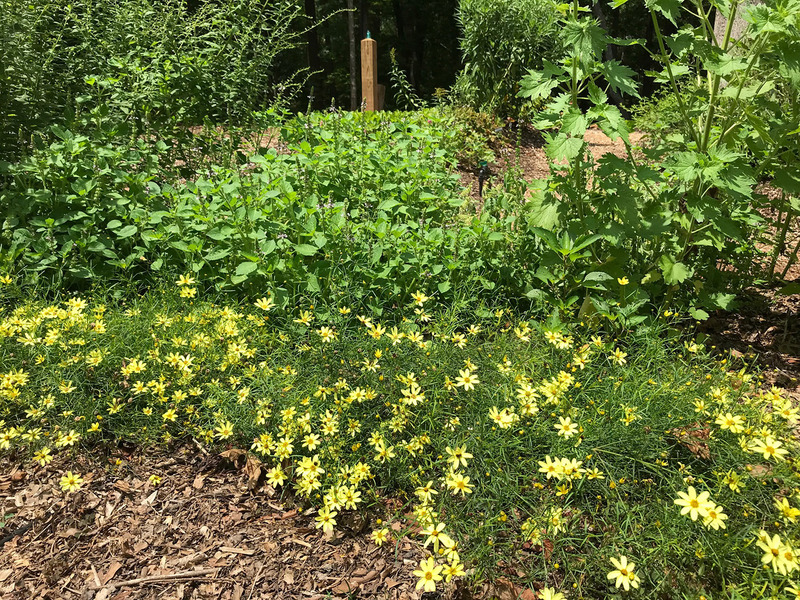 A native, medicinal and edible garden requires a caretaker, and there’s so much to learn about how to care for it, that a typical landscape crew typically won’t do. 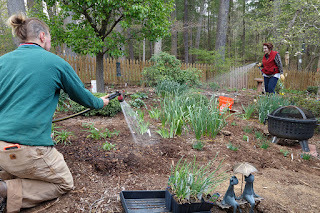 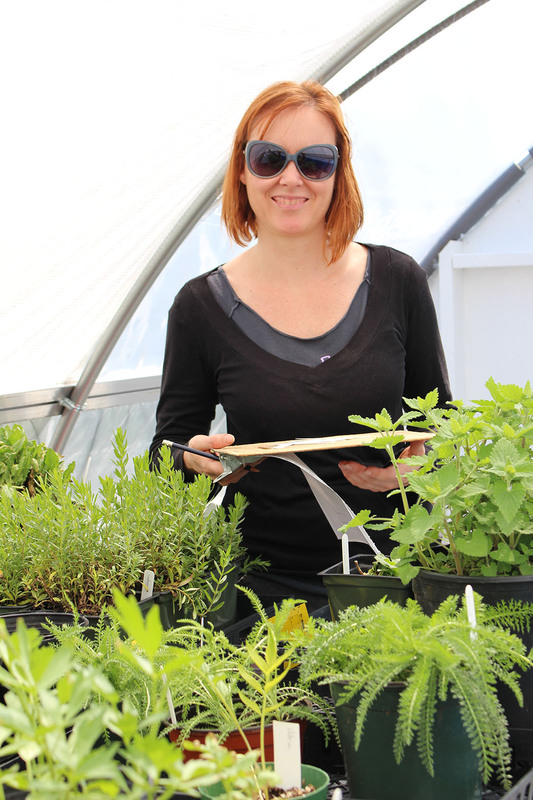 While M R Gardens will continue to train other gardeners to help clients maintain their gardens, we’ll likely be hesitant to take on a client who can't participate in the project. A unique piece of most all M R Gardens’ landscapes thus far is involvement of the clients, even if they are just researching and recommending the types of plants we use, and we’re in the midst of evolving our business model so we can continue to keep that theme. 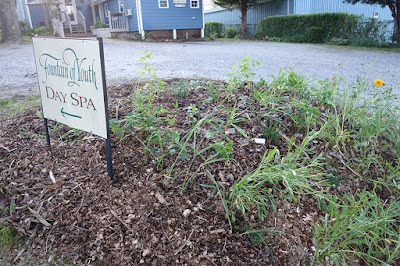 That all said, the spa owner (who did by the way help us plant a few pots in between giving services to her clients) was very pleased to see the old bushes replaced with plants that she said the birds seemed to be singing a tune for. 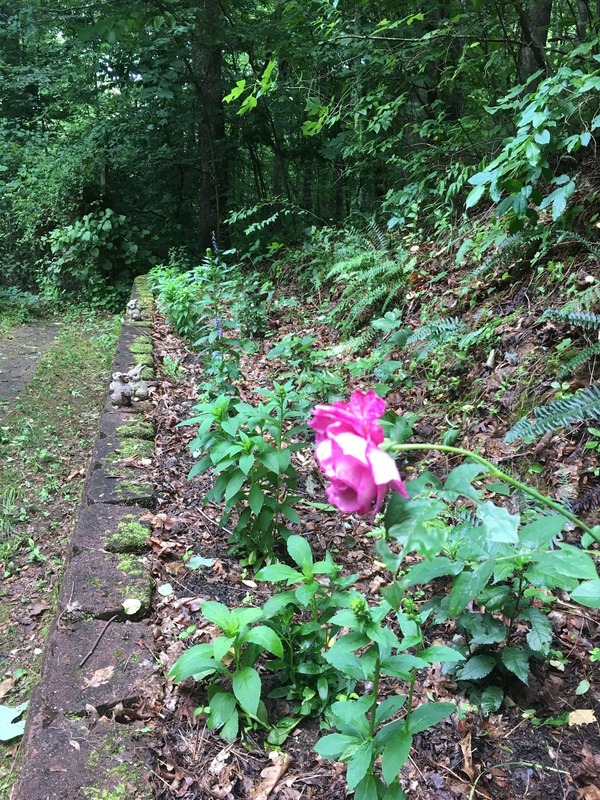 We appreciate her giving natives a try and look forward to hearing how the landscape evolves over time. 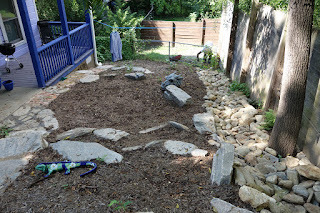 We completed another stage of the Black Mountain Elementary School slope, which the Town of Black Mountain has been helping transform from a grassy and weedy mess to something more useful and educational for the school. 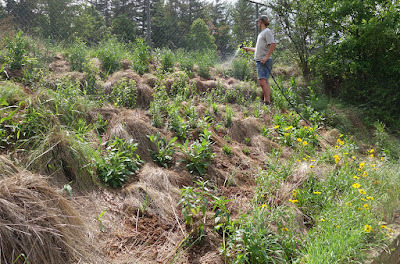 Late April - we planted into a slope that we had solarized with plastic so the existing grass became a mulch when it died off. 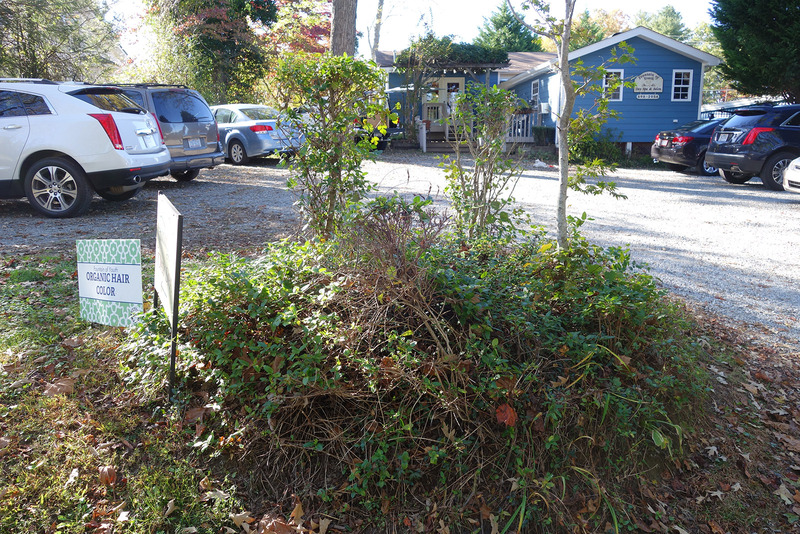 Due to some recent changes at the school and town, the rest of the slope might not be completed unless the public decides to make it a priority. 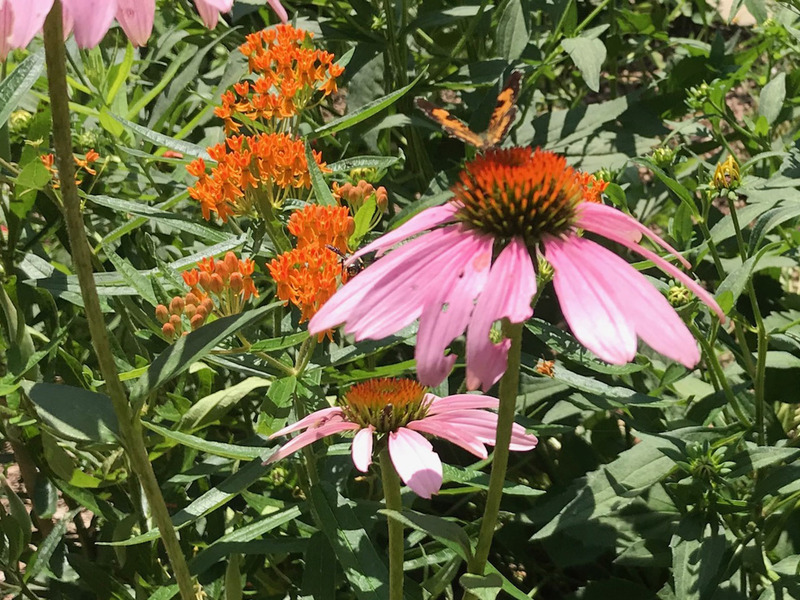 If you’re interested in donating funds or time so that the remaining landscape plan can be completed, which includes native pollinators and slope stabilizers, contact us and we’ll put you in touch with the Town. 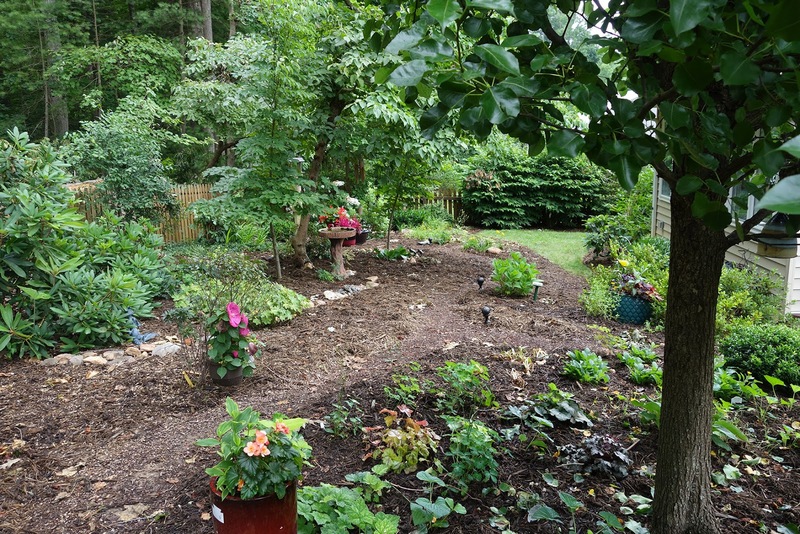 Right now, it's in most need of an experienced gardener familiar with naturalized landscaping to help keep it looking a bit tidier. Even a naturalized landscape needs some attention. 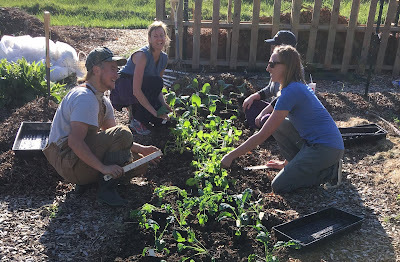 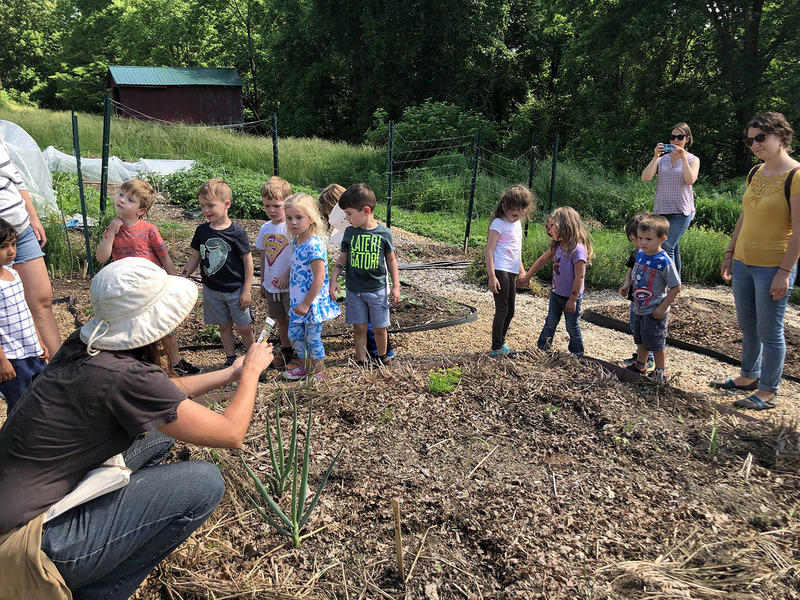 This year we also hosted a year-long program for gardeners who want to learn sustainable practices as well as grow their food together. 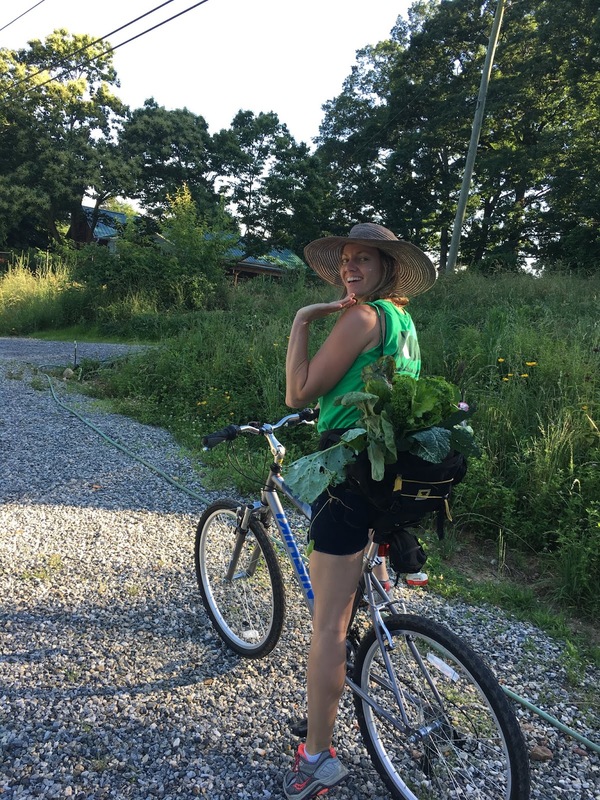 When new gardeners spend their first year on a farm, there is so much to take in, that often all they can do is just experience it without actually retaining the details. As adults, fact retention is even more challenging because we are bringing so much from our rushed daily lives that all we can realistically do when with the plants and classmates is recuperate and socialize. So to expect a graduate from the Emergence program to actually have paid work after leaving the year-long program may have been ambitious. 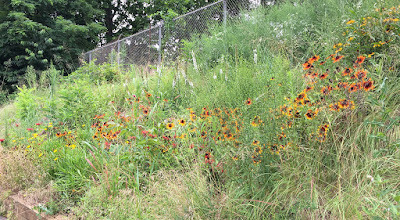 But yet, that’s what I’m seeing. 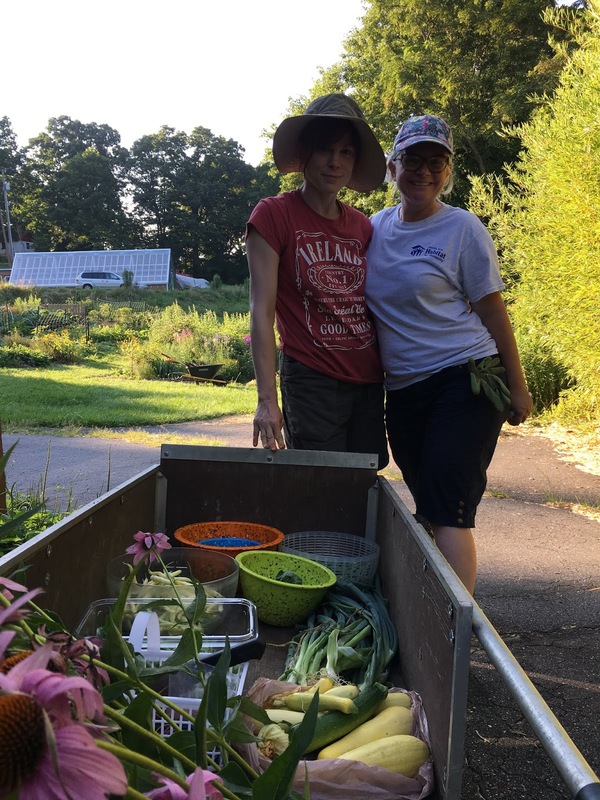 They’re becoming independent landscapers (if they’ve had years of prior experience), or they’re picking up some extra work by lending a hand to more experienced gardeners, or they’re writing articles for newspapers using the farming knowledge they gleaned in class. 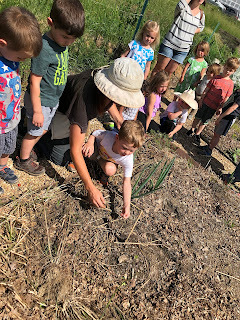 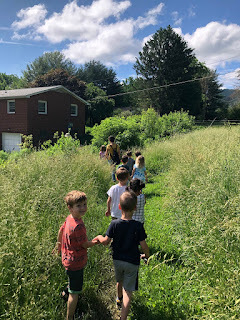 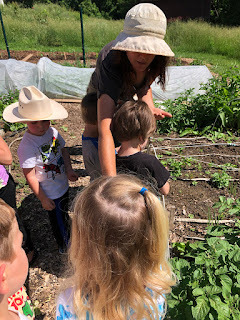 And most rewarding of all, positive changes have emerged in their families and home lives due to some of the reconnecting they did while at the farm. As I design programs for the future, I’m considering intentionally creating opportunities for people in the midst of a transitional time who need the therapeutic experience of gardening. In the meantime, I’d like to establish programs for budding professionals who have already gone through an extensive healing experience at a farm or in natural settings so that they can jump quickly into paid work and be a part of M R Gardens as it grows. 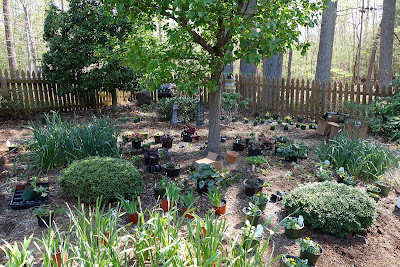 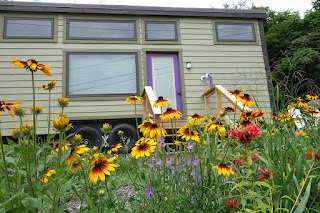 Stay tuned – I’ll update the Learn at the Gardens page once I figure it out!